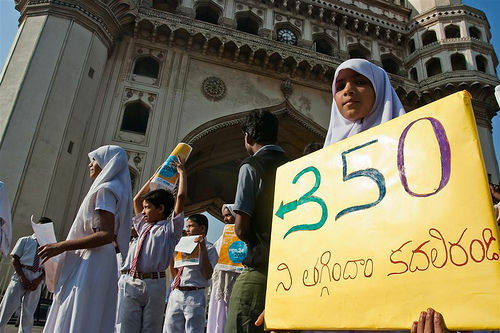 Throughout India and South Asia people participated in the International Day of Climate Action, Oct. 24, which was organized to bring attention to the necessity of reducing global warming gasses, especially carbon dioxide, from the current 380 parts per million to 350 ppm. India’s press has widely published the news about U.S. President Barack Obama saying he will reverse the Bush-era policy of ignoring international treaties on climate change, like the Kyoto Protocol, and work to cut greenhouse gas emissions globally and by the United States. 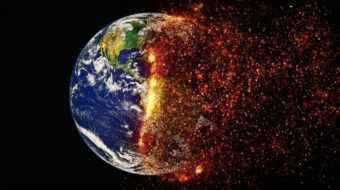 The recent passage of the U.S. climate bill by the House of Representatives denotes a meaningful departure by the Obama administration to ward off the danger of climate change that threatens to eradicate much life on planet Earth. No wonder the left press in India is expressing hopes of some meaningful decision from the December 2009 Copenhagen conference. The report of the International Food Policy Research Institute for the Asian Development Bank has warned that global warming (meaning human-caused climate change) poses a threat to all regions of the world, but South Asia, along with mid- and southern African nations will be the hardest hit early on. Whether it is New Orleans, or flood and hurricane disasters in Indonesia, or floods in Indian states of Andhra and Tamil Nadu, the ravages of climate change are obvious to their inhabitants. For several decades now, less rain has visited Indian areas. Out of a total of 600 districts in India, 533 have been surveyed by country’s Meteorological Department and 340 districts have been declared drought ridden. A decrease in food grains has been occurring for several years as well as a decrease in pulses, oil seeds and sugar cane production. Climate change and food security go hand in hand in South Asia. Prices have been sky rocketing each year. 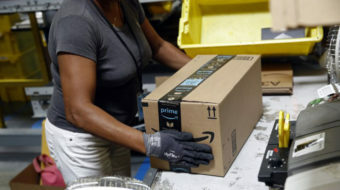 Profiteers flush with speculative capital use the shortages to build profits as never before. The Left parties in India are mobilizing against price rise. They point to the Indian central government for its policies, but they also blame the industrially-developed “West” and its incessant greenhouse gas emissions. However, the Left parties point to the role of India’s own bourgeoisie and landlords exercising influence on the government and profiteering from the food insecurity. Left parties call for investment in the state-owned and managed food ration shops, which could supply the daily needs of calories without the profiteering costs. Such an investment would require no loans from the World Bank, the left charges. But how much responsibility does India – the largest South Asian nation – (or China) bear in adding to greenhouse gas emissions? For India’s development and global commitment towards climate change (India is a signer of the Kyoto Treaty) the left has called for energy equality, delivering energy to areas where there is none. But the increase of emissions must be, they argue, accompanied by energy conservation measures, especially by corporate India and better-off sectors of society. India has been in the forefront internationally of raising the issue of a fair way to cut global warming emission. And like President Obama has said, no one country can do it alone. Everyone will have to pull their fair share. United Nations Framework Convention for Climate Change is meeting in Copenhagen in December. At this meeting, a final global agreement is likely to be given a final shape by the representatives of 190 or so countries. Yet most Third World countries feel that the developed economies of the world will continue to be vague in defining and discharging their obligations to restrict emissions. For developed countries corporate sectors, especially energy sectors, they will say cutting emissions is too cost prohibitive. But saving the life on earth has never been their priority. The Intergovernmental Panel on Climate Change has warned so many times that due to the failure in meeting Kyoto Protocol targets, the danger of a two degree C rise of temperature will shortly become a reality. So drastic measures are needed both in the short and medium term. But the G8 and G5 meetings have said they will work between now and Copenhagen for a global goal of reducing emissions by 2050. And reduction targets are not quantified. These long term targets mean nothing if medium term targets are neither defined nor achieved by 2020 or 2030, which the EU has been asking for. So the whole blame is shifted to the U.S., which the Third World thinks is still not ready for a global commitment to cut emissions. Rama Kant Sharma was born into a Communist family from Punjab, India in 1933. As a young boy, he became active in politics in 1944 as a student freedom fighter against British colonial rule. Sharma joined the Communist Party of India in 1949 and worked for it as a student until 1954. Sharma was a biology teacher and trade union organiser of an 18,000 strong teachers association in Delhi from 1954 until 1963. 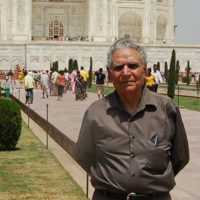 Sharma went to Ethiopia in 1963, with his wife, also a teacher, where the two of them taught in that country. Later he graduated in medicine from Calcutta University, and returned to Delhi to serve working families as a medical practitioner,while working as a voluntary medical doctor to the Communist Party of India's office until 1996. Sharma has run for office (parliament) as a Communist candidate. Sharma was a founder and organizer of the Indian affiliate of International Physicians For Prevention of Nuclear War. After all four children, all of whom are medical doctors, immigrated to the United States, Sharma and his wife also immigrated to the United States. Sharma is currently active in U.S. progressive politics and a member of Physicians For Social Responsibility.